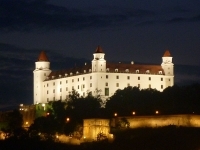 Situated on a hill 269 feet (82m) above the city, Bratislava Castle is a prominent structure on the city's skyline and provides excellent views of the city, as well as over Austria and even as far as Hungary in fine weather. It has been inhabited for thousands of years due to its important location on the Danube River in central Europe, and has been destroyed and rebuilt several times in its history, undergoing a series of reconstructions and extensions. Four towers make up the enormous castle building, enclosing a courtyard, a Treasure Chamber, and collections of the Slovak National Museum.